The arts come alive every spring during the annual May Festival of the Arts! This unique, month-long festival celebrates art that makes Eureka Springs the creative capital of Arkansas. This years festivities will feature dozens of exhibits, demonstrations, artist’s receptions, gallery walks, free concerts, parades and much more! This event is perfect for a weekend getaway or a family vacation! This annual favorite is colorful, quirky, energetic and sometimes surprising! The ArtRageous Parade is the traditional kick-off of the May Festival of the Arts. This year’s parade will feature floats, art cars, walkers, dancers, musicians, jugglers and the super popular, Africa in the Ozarks drum and dance group. Eureka Springs is known for it’s many art galleries and monthly Gallery Strolls. This year, the May Festival of the Arts brings us the Grand Gallery Stroll. Galleries will be producing specialized exhibits specifically for this event. Dress is casual, drop in and drop out. Fun is mandatory, purchasing is not. Refreshments (21+) will be served. Nationally-known chalk street artist Craig Thomas will lead the chalk art fest and conduct workshops. Craig will be joined by several local and regional artists with final reveals and event planned for 5/20. Mark your calendars for the 3rd Annual Plein Air Festival “ESPAfest”! This event is May 22-24 at various beautiful and historic locations in Eureka Springs. Over 60 artists from across the country come together for four days of intense plein air painting in and around the beautiful town. Opening Reception to be held at the Eureka Springs School of the Arts Campus. These and other great events are happening in Eureka Springs for the month of May! 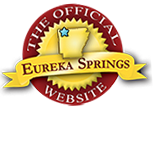 For a complete Eureka Springs calendar, click here. This entry was posted on May 10, 2018 by service424 in Arts & Culture, Crescent Hotel, Festivals, Fun Downtown and tagged art, artrageous, downtown, festival, May Festival of the Arts, walk, white street studio walk.